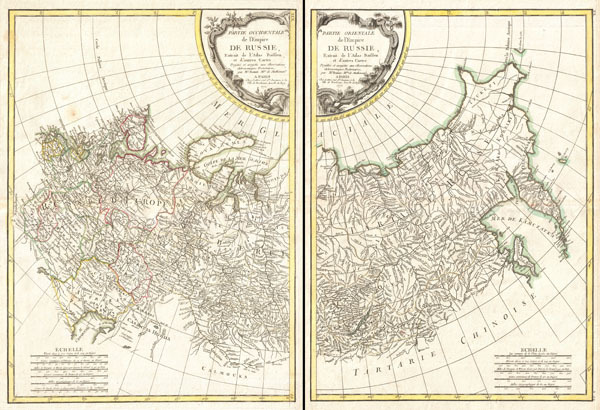 A beautiful example of Rigobert Bonne's 1771 decorative map of Russia. On two sheets, covers from the Baltic Sea to Siberia and the Bering Straits, extends south as far as the Caspian Sea, Sakhalin and Kamchatka, extends north well into the Arctic. Details this fast region and its many complex river systems and mountains ranges. European Russia is divided into various smaller states including Kiev, Woronez, Bielogorod, Moscow, Astrakan, Kasan, etc. The extreme northeast clearly exhibits information gathered by the explorations of Vitus Bering and Tschirikow, especially with regard to Kamchatka and the Bering Strait. A mysterious land mass - clearly North America, is noted in beyond the Siberian mainland with a note 'Cote decouv. en 1730' (Coast Discovered in 1730). A decorative baroque title cartouche appears top center. Drawn by R. Bonne in 1771 for issue as plate nos. 22 and 22 A in Jean Lattre's 1776 issue of the Atlas Moderne. Very good condition. On Two sheets. Both sheets exhibit original centerfold. Blank on verso. Rumsey 2612.044, 2612.045. Phillips (Atlases) 664. National Maritime Museum, 215. British Libarary (World), col. 384-385 (1762-1785 eds. ).